Starbucks has opened its first (of presumably many) tea houses. Teavana Fine Teas & Tea Bar offers a large selection of hot and cold and specialty teas. Teavana Fine Teas & Tea Bar, 1142 Madison Ave., New York, NY 10028, 212-288-1506. Masaharu Morimoto has opened Bisutoro in the space that once housed his short-lived TriBeCa Canvas. The restaurant’s name means "bistro" in Japanese and the place is, indeed, a Japanese bistro. The menu interprets Western dishes using Japanese ingredients and also offers Japanese standards prepared with Western products. Bisutoro, 313 Church St., New York, NY 10013, 212-727-0644. Golden Cadillac, anchored on the corner of First Avenue and E. 1st Street, evokes 1970s cocktail and dining culture with dishes like tomato soup and drinks such as dirty martinis. Golden Cadillac, 13 First Ave., New York, NY 10003, 646-924-8153. "Top Chef" alum and LA chef Ilan Hall is making his way to the Big Apple. It's been announced that Hall will open a version of his restaurant The Gorbals in the Williamsburg section of Brooklyn. Hall is hoping to open the new venture by April 2014. In the Alphabet City portion of the East Village is the new bi-level Apt-13, a rustic-looking eatery helmed by chef John Keller. The menu offers comfort food with worldly flair. Dishes include steak frites, kale Caesar salad, and a burger made with grass-fed beef. Apt-13, 115 Ave. C, New York, NY 10009, 917-475-1213. Chef Michel Richard’s Villard Michel Richard and Gallery at Villard Michel Richard are located in The New York Palace hotel, the same property that once housed Le Cirque 2000 and Gilt. The former serves an à la carte bistro menu while the latter offers prix-fixe menus of more sophisticated French fare. Villard Michel Richard, The New York Palace, 455 Madison Ave., New York, NY 10022, 212-891-8100. Chef Michel Richard has opened Pomme Palais, featuring both sweet and savory items, including pastries, sandwiches and breakfast offerings. Pomme Palais, 30 E. 51st St., New York, NY 10022, 212-891-8100. An outpost of RedFarm, the popular West Village dim sum restaurant from Joe Ng and Ed Schoenfeld, has opened on the Upper West Side. The new RedFarm, located in the space recently occupied by Fatty Crab, has the same rustic look but is larger than the original. RedFarm, 2170 Broadway, New York, NY 10024, 212-724-9700. Isola on Columbus is Sicilian-born restaurateur Sebastiano Cappitta's resurrection of an earlier restaurant he once owned. As one may surmise from the name, this Upper West Side eatery’s focus is Italian cooking, and the place has a wood-burning brick oven. Isola on Columbus, 994 Columbus Ave., New York, NY 10025, 212-665-2970. Danny Bowien, the chef behind popular Mission Chinese Food in San Francisco and New York's Lower East Side, has announced his next project. On November 20, he'll open Mission Cantina, a restaurant that will serve an array of Mexican dishes from around the country. Mexican beers will be on tap and, unlike Mission Chinese Food, reservations will be accepted. Mission Cantina, 172 Orchard St., New York, NY 10002, no phone. Chef David Santos and Louro want to cook up Sunday supper for you. Every Sunday evening diners at the West Village restaurant will have the chance to eat a three-course meal for $35. The menu options will change weekly. As the season progresses toward winter, dishes will grow heartier. Louro, 142 W. 10th St., New York, NY 10014, 212-206-0606. Chef George Mendes has given diners another menu option at his Portuguese restaurant Aldea. There's now a menu inspired by the cuisine of Goa. Dishes include eggplant with coconut vinegar and lobster curry, among others. Aldea, 31 W. 17th St., New York, NY 10011, 212-675-7223. Momofuku Ko, David Chang's most acclaimed restaurant, will move at the end of the year to a small alley, Extra Place, on E. 1st Street and the Bowery. The lease is up on the Momofuku Ko space and the new location will offer a bigger kitchen and more tables for diners. Momofuku Ko, 163 First Ave., New York, NY 10003, 212-500-0831. Chef Heston Blumenthal, known for his The Fat Duck outside of London, has scrapped his plans to bring his restaurant called Dinner by Heston Blumenthal to the Big Apple. Tom Colicchio is bringing his Craft empire to Brooklyn. The chef and Top Chef judge is opening his first Brooklyn restaurant near BAM and the new Barclays Center. Craft, 43 E. 19th St., New York, NY 10003, 212-780-0880. Super chef Joël Robuchon, whose eponymous New York restaurant, L'Atelier de Joël Robuchon, shut down last year, recently said that he's looking at new spaces to reopen the restaurant. The second iteration of his eatery will likely be in Midtown. There's no word yet, though, on when it would open. Pastis, the scene-y Meatpacking District restaurant owned by mega-restaurateur Keith McNally, is reportedly closing on January 1 because the building that houses it is going under renovation. McNally says, though, that Pastis will live to cook another day, even if it's at a new location. Pastis, 9 Ninth Ave., New York, NY 10014, 212-929-4844. Polo Dobkin, a former chef of now-closed Dressler, plans to open a restaurant at the same Williamsburg address. The launch date and restaurant concept have yet to be announced. Sirio Ristorante, located in The Pierre, A Taj Hotel, New York, has a new chef: Massimo Bebber, who has served time in the kitchen at Caravaggio. 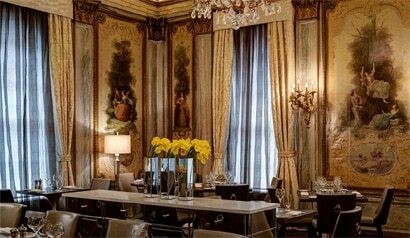 Sirio Ristorante, The Pierre, A Taj Hotel, New York, 795 Fifth Ave., New York, NY 10021, 212-940-8195. Michael Wurster, who has logged time in the kitchens of Le Cirque 2000, The French Laundry, and Alain Ducasse at Essex House, is the new chef at Gordon Ramsay at The London. Ramsay is certainly hoping Wurster can breathe new life into the struggling restaurant. Gordon Ramsay at The London, The London NYC, 151 W. 54th St., New York, NY 10019, 212-468-8888. Erstwhile Esca pastry chef Tracy Obolsky is the new pastry chef at North End Grill. North End Grill, 104 N. End Ave., New York, NY 10282, 646-747-1600. Jeff Porter has been named the new wine director at Babbo. Porter will retain his job as the wine director of Del Posto while splitting duties with the Batali flagship restaurant. Babbo, 110 Waverly Pl., New York, NY 10011, 212-777-0303. Wine-centric Gramercy Park restaurant Veritas has shut down. Veritas, 43 E. 20th St., New York, NY 10003, no phone. The West Village’s Pizza Roma could not keep up with the intense pie competition in the neighborhood and has shut down. 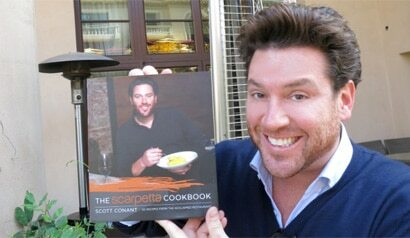 It is rumored one of the owners of Emporio, the NoLIta Roman restaurant, may be interested in the space. Pizza Roma, 259 Bleecker St., New York, NY 10014, no phone. Restaurateur Keith McNally announced he's closing Pulino's Bar & Pizzeria at the end of the year and eventually will open another restaurant in the space called Cherche Midi. Pulino's Bar & Pizzeria, 282 Bowery, New York, NY 10012, 212-226-1966.